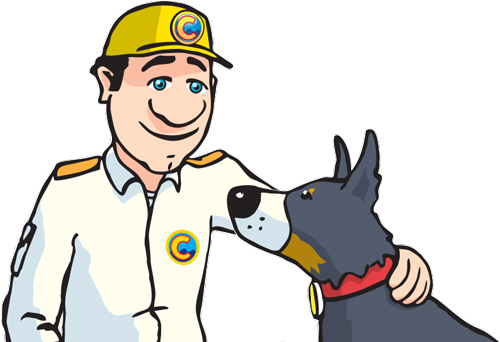 Hi, I’m Colin and I live with Rocky my Search and Rescue dog at the Coastguard Cottage in a small fishing village called Tideswell. 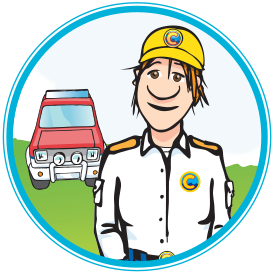 I work as a Coastguard and together with Rocky, make sure that people are safe when they are at the seaside, on the cliffs or on the beach. If anyone is in trouble I can quickly contact my friends who are always ready to help. 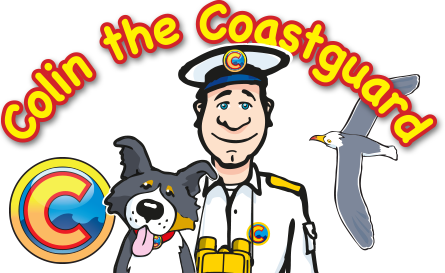 REMEMBER, if you see anyone in trouble at the coast, call 999 and ask for the Coastguard. Slippy is Colin and Rocky’s Seagull friend. 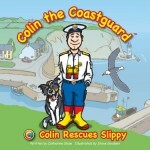 You can read how they became good friends in their first adventure ‘Colin Rescues Slippy’. Slippy is always nearby and patrols the skies high over Tideswell and the nearby Pebble Island. 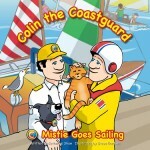 He often helps Colin and Rocky by being their lookout at sea. Embers is the Tideswell Fire Truck Officer. 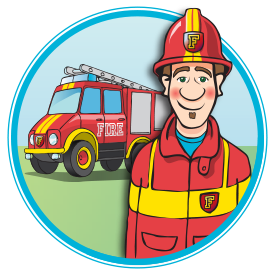 Embers and his Fire Truck crew are always on standby ready to help Colin in any emergency. Embers Fire Truck is very fast when its blue lights are flashing. 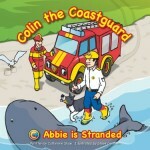 You can find out how long it took him to get to the beach in Colin and Rocky’s fantastic adventure ‘Abbie is Stranded’. 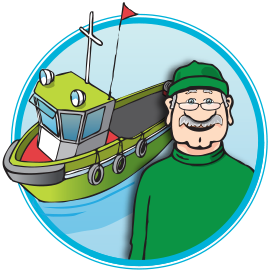 Winch is the Captain of the Tideswell Tugboat. Winch is a very old and experienced sailor on whom Colin can always depend. 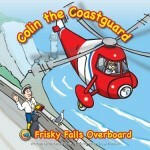 You can read how Winch helped Colin rescue the Pebble Island Ferry in their exciting adventure ‘Frisky Falls Overboard’. 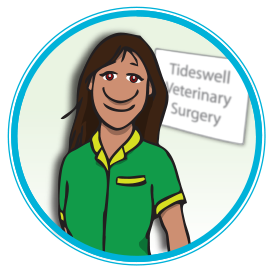 Mrs Sharma the Vet looks after all the animals in Tideswell and Pebble Island. Rocky likes Mrs Sharma as she made his paw better after he trod on glass. You can find out how Rocky hurt his paw and read how Mrs Sharma helped Colin, Rocky and Embers rescue Abbie the baby whale in their wonderful adventure ‘Abbie is Stranded’. 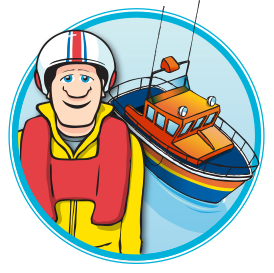 Goodwin is the Coxswain of the Tideswell Lifeboat. Goodwin and his crew can launch their lifeboat ‘Tilly-Rose’ at a moments notice whenever anyone is at trouble at sea. 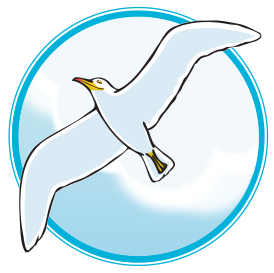 You can read how they helped Colin and Rocky during the Tideswell Yacht Race in their delightful adventure ‘Mistie Goes Sailing’. Shelley is Colin and Rocky’s Coastguard friend. 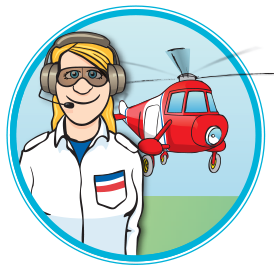 Shelley is part of the Tideswell Cliff Rescue Team and helps Colin and Rocky whenever someone is in trouble at the cliffs. You can read how Shelley helped Colin and Rocky Save a baby seal called Solo in their fantastic adventure ‘Rocky Saves Solo’. 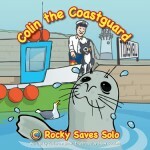 Garrison is Colin and Rocky’s Coastguard friend from America. The iBooks versions contain animations and sounds.